Cats have certain innate and natural instincts that they need to pursue if they are going to be truly healthy and happy. These include hunting, surveying territory from a perch, scratching, and climbing. When in the wild (or outdoors), cats have many opportunities to exercise these behaviors. Indoors, it’s our job to mimic the conditions that cats need so they can practice these natural instincts in the safety of their home. Now, the fun part! Some of our favorite ideas are listed below. The basics – Basic supplies like food dishes, water bowls and litter boxes are also a part of your cat’s environment. Especially in multi-cat households, it’s important to note that cats may compete for these important resources, and shy cats may avoid resources if they have to cross paths with a more aggressive housemate. It’s best to provide dishes and litter boxes for each cat to avoid bullying. Playtime – Environmental enrichment for cats is not just about toys, but it can be a great start. Choose toys and games that your kitty enjoys, and expand their horizons every so often. Novelty is key for cats, who need mental as well as physical exercise every day in order to thrive. Use interactive toys like feather wands, and add in object play with crinkle balls, furry mice, and other small toys. For real fun, cut paw sized holes in an empty tissue box and place any of these in. Tape up the sides, and watch your kitty go to town! Bring the outdoors in – One of the best ways to add to your cat’s environment is with safe outdoor spaces. Catios are all the rage, and run the gamut from an outdoor temporary tent, to tunnels, to window boxes, to full-on cat enclosures. Bringing in some cat safe plants for grazing is always a great idea. Catmint, grass, spider plant are a few of our favorites. Browse the ASPCA list of non-toxic plants for more ideas. Climbing the walls – You don’t have to spend a lot of money to create a special place for your cat to climb. Vertical space for climbing and surveying their territory from above can be a standard cat tree, or wall hanging shelves or perches. Scratch it – We all know that if your cat doesn’t have an excellent scratching post, they’ll find one in your couch, favorite chair, or carpet. 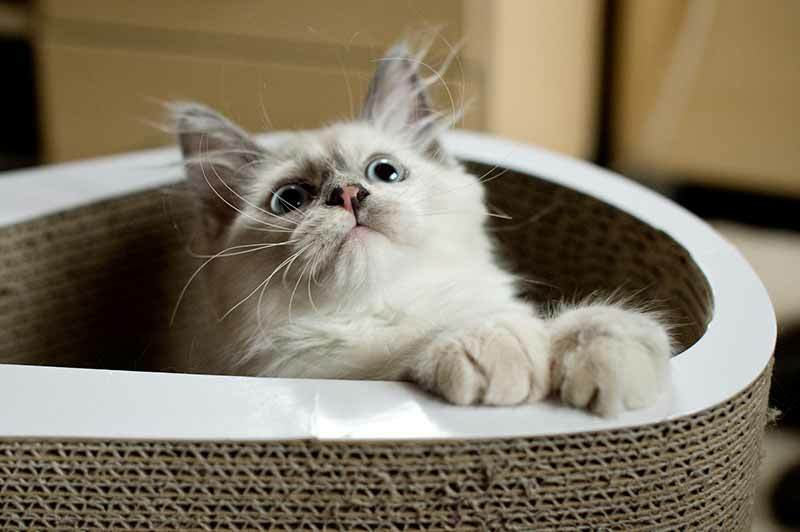 Choose a scratching post that allows your cat to stretch to her full length, to keep her the happiest. No matter how confident your cat is, make sure there are hiding places in her environment as every cat needs to hide now and then. Have fun creating your cat’s space, and give us a call if you need any more ideas or have questions. Your team at Rocklin Ranch Veterinary Hospital wants to know if you’ve already done some environmental enrichment for cats in your household! Previous: A Shout-Out to All (Legitimate) Service Animals!